For me, the art was the single best thing about this issue. Marco Checchetto has put in some beautiful work throughout this arc, and here he spices that up with some really nice panel layouts, and very strong action scenes. Checchetto creates a vibrant atmosphere that breathes real life into this mystical and unusually foreign little tale. Daredevil #507 also contains one of strongest character scenes I’ve seen in quite a while as Matt, toward the end of the issue, begins to show both doubt about this role he has been cast to play and an openness to remembering who he used to be. As for the rest of the issue, those of you who have been following this blog for a while know that a 6.5 out of 10 is not a high grade for me. Don’t get me wrong, it’s a passing grade and this is by no means a bad issue. However, it suffers a little bit when measured against the very high expectations I had for it going in. 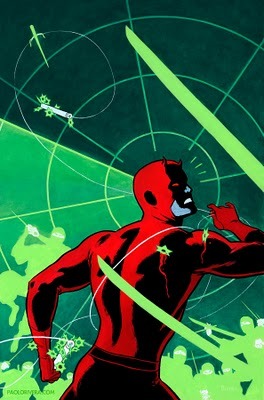 The entire current Daredevil team has done a fine job of filling the big shoes left by Brubaker and Lark and making what could have been a too jarring change in status quo actually work. I’ve become accustomed to expecting great things from these guys, especially with how much I enjoyed the previous two issues. One of the problems with Daredevil #507, for me, is that it reads more like the middle issue of a story arc than a final issue. Last issue left us with a huge cliff-hanger that this issue isn’t quite able to match. Because this issue leads us into next month’s Shadowland, I’d expected a different kind of send-off than the one we get which actually left me quite confused and had me reading the entire arc all over again (which did help, by the way). In order to discuss the events of this issue in more detail, I’m going to have to get into some spoilers so don’t read beyond this point if you want to stay safe. This arc as a whole provided two big reveals, the first being that White Tiger has been turned from ally to traitor. How this happened gets a satisfactory explanation in this issue where we learn that her conditioning has resurfaced without the Black Tarantula and his healing factor around. The second big reveal, which comes at the end of this issue doesn’t feel quite as big. We learn that the other daimyo have planted the seeds for Shadowland. This is interesting, and I’m sure this will tie into the coming issues in great ways, but it’s not that suprising. We also learn that these leaders are members of the Snakeroot. If that name doesn’t ring a bell, you’re probably not alone. Even a die hard Daredevil fan like myself had to dig through the mental archives for a minute before it came to me: Fall From Grace, early 90’s. I’m actually a fan of writers digging up obscure things from the past (though the Snakeroot clan is clearly an established, if somewhat vague, part of The Hand’s continuity) and there’s plenty of opportunity for the writers to add to the mythos and flesh out the details. However, there’s something a little anti-climactic about learning that the leadership of an evil ninja order like the Hand is just as evil as you’d expect. This brings me to another thing that bothers me a little about how this arc came to a close, and that is the reason Matt was in Japan to begin with. I can see how the leadership wanted to get close to Matt and screw with his head a little (and ultimately persuade him to follow the path they intend for him), but as far as Matt is concerned, he’s there to attend to the situation with Bakuto and his roguish tendencies. Was this just an existing situation that they decided to use as an alibi? Also, at what point did Angela’s healing begin to wear off? She’s supposed to have been the one who fed him the idea of Shadowland, but that must have been long before she hit Japanese soil. I guess we can assume that Carlos keeps his healing hands off her tush. To conclude, does this issue in any way lower my expectations for Shadowland and next month’s Daredevil? Not in the least. In fact, I remain as convinced as ever that Diggle and Johnston have a well thought-out plan for this story. And, as a whole, this has been a very enjoyable arc full of new and well-written characters and complete with a setting and atmosphere that’s been a nice breath of fresh air (and snow). As far as fully understand everything that’s going on, I may just need to sleep on it. I love “Fall From Grace”. It’s the first Daredevil story I *really* remember from my childhood. I’ve re-read it multiple times since then and still get a kick out of it, though I’m under no illusions that it’s a perfect story. Having the Snakeroot pop up here was a great nod to that under-appreciated story and got me giddy as only fanboys get. But, I think Christine is right when she says that it’s hardly a surprise that the bad guys turn out to be bad guys. Indeed, the more I think about it, the more confused and disappointed I am. Is this a reveal at all? Weren’t the Snakeroot ALWAYS the Inner Circle of the Hand, or at least the mystically-inclined portion thereof? It’s certainly not to be taken as gospel, but Wikipedia’s entry on the Hand suggests that the Snakeroot had taken over the Hand a bit after 1588 and were the ones responsible for all the body-vanishing-in-smoke business we associate with the Hand’s dead warriors. Christine’s comment about Carlos keeping his hands off Angela’s tush made me giggle and also brought another thought to mind. Has anyone else noticed how much hotter Angela has gotten over the years? Go back and look at her as an FBI agent. She looks like a normal 30- or 40-something who’s overworked and tired. Look at her now: smokin’ hot 20-something model-type. Those White Tiger amulets are something else! And has anyone ever counted up how many Hand ninjas Matt has killed over the years? For a guy who “never kills”, he has killed probably hundreds. I particularly noticed this when he threw an icicle through a guy’s eye in this issue. Awesome! Also, very deadly. I don’t think Hand ninjas don’t count as people just because they’re evil and slightly magical. Sorry to ramble on. Hiroshi was a Hand character at the end of Brubaker’s run, when Matt was offered the position of Shogun. Well, here’s my dumb decision of the day: time to disagree with the man writing the book. Hirochi (with a ‘c’) was the Hand leader in NYC who oversaw Lady Bullseye. To my knowledge, he first appeared in DD #111, had his hand sliced off by Izo in DD #115, and was later killed by Kingpin in DD #500 (would’ve been #120). I can’t find an instance of his name being spelled other than with a ‘c’. When Hiroshi (with an ‘s’) was first mentioned in DD #505 by the other daimyo, he’s referenced as having been passed over by Izanagi for Bakuto. Thinking this was a different person, I took that to mean that he was another of Izanagi’s lieutenants who was given a lesser rank than was Bakuto. Thus, when Izanagi died, I thought Hiroshi would’ve become one of Bakuto’s lieutenants. I wasn’t sure why the daimyo were discussing a character who was entirely off-screen unless he had become one of Bakuto’s lieutenants and we had actually seen him at the summit. (It’s not like I got Bakuto’s lieutenants’ names.) I then figured he was killed at the same time as Bakuto. I can’t find an instance of his name being spelled other than with an ‘s’. I feel like I’ve won the lottery. I’m as giddy as a schoolgirl (who happens to be giddy)! For the sake of completeness, I should mention that Aaron’s guest post has now been published. Great job, Aaron!